The new single titled “Change” is out now and available everywhere digital music streamed and downloaded. A link from the Music page to the iTunes store is now live. Dommin has announced that their new single “Change” is now available for pre-order. The release date is Friday, March 1st. You can hear a clip of this new track in the promos on Instagram, Twitter and Facebook. We have the option of expanding items to towels, pillows and more but we’ll start with this to see what the demand is like. If you want more, we’ll get ya more! We will still have our old merch store at www.dommin.net for older merch items and CD’s/Vinyl as well as free downloads of our cover songs. We will keep this linked from the Store link as well. Let us know on our social media what you think? Dommin has set October 26th as the release date for their next single “Upside Down.” Pre-Orders will be available starting October 19th. The song will be available everywhere digital music is sold and streamed. One week after “Strings” was released on August 24, 2018, Dommin has released another new song entitled Clearly. It is available now everywhere digital music is streamed and downloaded! Dommin has released a new song called “Strings” which is now available on all digital download and streaming services. Check it out today! Friday, May 25th 2018, Dommin has released the first song since the album “Beautiful Crutch” was released in December of 2016. “Beautiful As A Stranger” promises to be the first of a few tracks to come out over the next couple of months. You can find this new song everywhere digital music is sold. 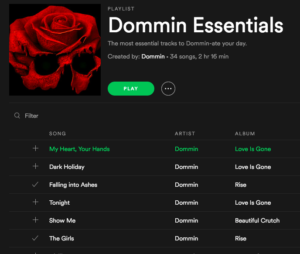 Dommin has created a “Dommin Essentials” playlist on Spotify for you to Domminnate your day. You can find the playlist below. So please subscribe! 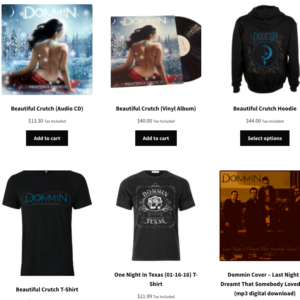 The band has posted the remaining vinyl for the “Beautiful Crutch” album in the Dommin Store at www.dommin.net. The album includes a lyric sheet with a signed band poster on the reverse side. There are less than 40 remaining in stock and they won’t be resupplied. So get this collectors item before they are gone. Other items from the recent PledgeMusic campaign for “Beautiful Crutch” are also up in the store including shirts, hoodies and collectable pins.